Technology stocks continue to be the most attractive to Millionaires, according to Spectrem Group’s annual fourth quarter wealth level study, Asset Allocation, Portfolios and Primary Provider. For the fifth consecutive year, the highest percentage (61 percent) of Millionaire investors with a net worth between $1 million and $4.9 million (not including primary residence) indicate that technology is the sector in which they will most likely invest. This is up four percentage points from 2013. There is also growing interest among Millionaire investors in the healthcare and pharmaceutical sectors. 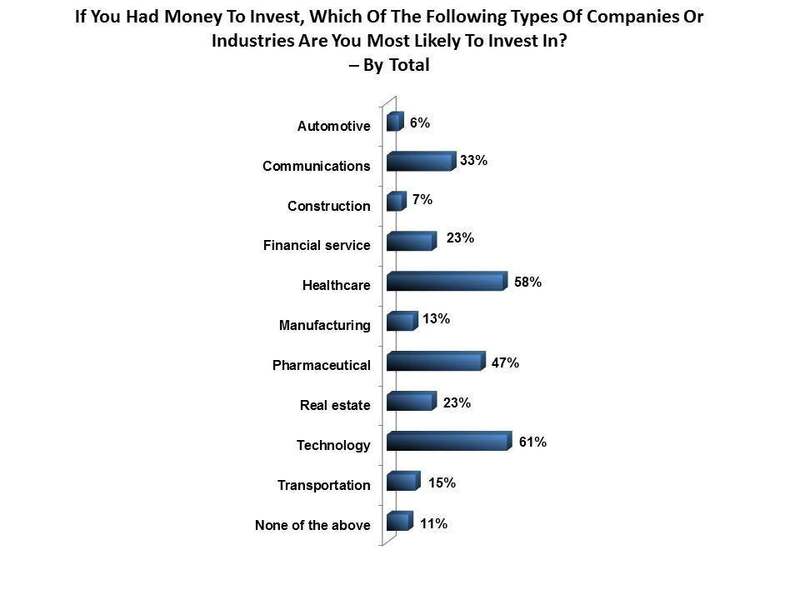 Nearly six-in-ten (58 percent) indicated they would be most likely to invest in healthcare companies, up from 53 percent last year, while almost half (47 percent) said they would be most likely to invest in the pharmaceutical industry, up six percentage points from 2013. One-third of Millionaire investors said they would be most likely to invest in communications companies. This is unchanged from last year. Nearly one-fourth (23 percent) indicated they would be most likely to invest in financial service companies and real estate. Surprisingly, technology is not the preferred sector in which to invest for the youngest Millionaire respondents. Just 40 percent of Millennials under the age of 40 said they would be most likely to invest in technology. This sector is most attractive to those between the ages of 45-54 (66 percent). Six-in-ten of those 55 and older, too, said technology was the industry in which they would be most likely to invest. Health care stocks are most attractive to Millionaires over the age of 65 (62 percent) and Baby Boomers ages 55 to 64 (60 percent). Millionaire Millennials are the most likely to say they would invest in real estate (38 percent, compared with 23 percent of respondents overall). Investment in the technology industry increased 17 percent in 2014, according to CNBC. Apple, bolstered by new products and its Apple Pay system, posted fiscal fourth quarter revenue of $42.1 billion and quarterly net profit of $8.5 billion. Analysts have said that these stablished companies are a safer bet than companies such as Alibaba, which set a world record last September for the largest initial public offering which raised $25 billion.